Place the chopped garlic scapes, oregano, and a good pinch of both salt and pepper in your food processor. Begin to pulse until the scapes start to break down into small pieces. Start to slowly drizzle in the oil while the processor is running. You want to get the consistency into a smooth, spreadable paste - not too oily (see below). Season with salt and pepper, to taste. Preheat the oven to 500 degrees. Lightly dust a pizza stone (or baking sheet) with cornmeal. Roll out your dough to fit your stone/pan and gently transfer the dough to the stone/pan. 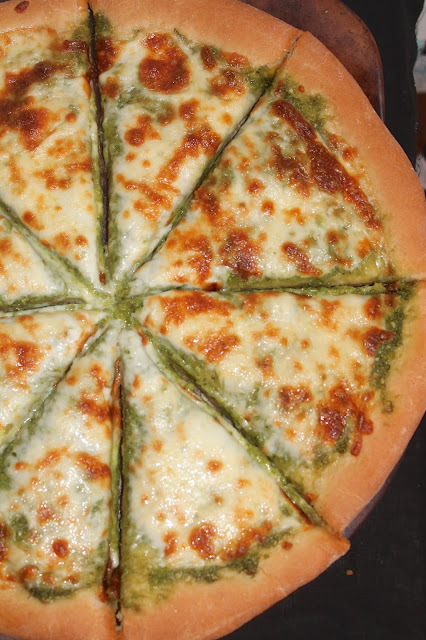 Spread the garlic scape sauce onto the pizza, leaving about a 1/2-inch crust along the edge. Top with both cheeses. Bake on the bottom rack of the oven for about 10-13 minutes, until the crust is golden and the cheese is golden. Let the pizza cool for a few minutes before slicing and eating. Girl, you make one good looking pizza! That's a fantastic pizza, Amy. Totally love that garlic scape sauce. I can never get enough pizza recipes. This sounds amazing!! What a mouthwatering pizza!!! I do something similar with pesto but I would bet the that garlic scape puts that to shame! PINNED! 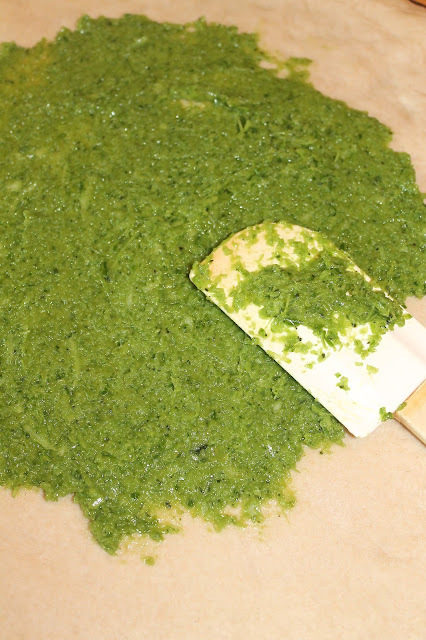 Love this garlic scape pesto. Great on pizza, I'm sure, but I can think of a ton of uses for it. The garlic scape pesto sounds amazing! What a fancy pizza! Major kudos to you for working with an ingredient as unique as garlic scapes. This is my kind of pizza since it doesn't have tomato sauce. ooh this looks great! I love homemade pizza! I can't have garlic but I sure love it and miss it on my pizza. Love the idea of pesto on pizza, I've never tried it! That is one delicious looking pizza! I've never used garlic scapes, but I'd sure love to try.